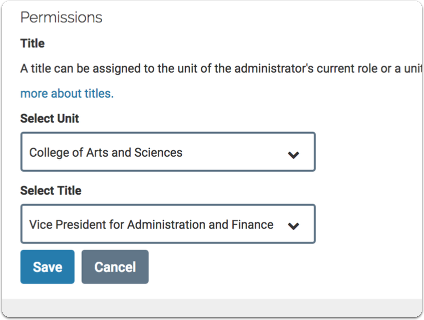 Users with the role of "Administrator" in Faculty Search can also be assigned a title such as Dean, or Department Chair, in the unit they administer and all units below. This title will allow them to approve positions created by all units they administer before they can be posted. 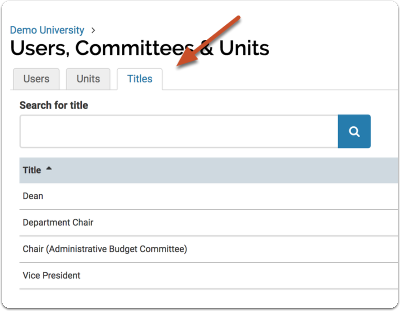 Titles are created on the "Titles" tab of the Users & Groups page of Faculty Search. Titles are then assigned to administrators when editing the user's permissions. 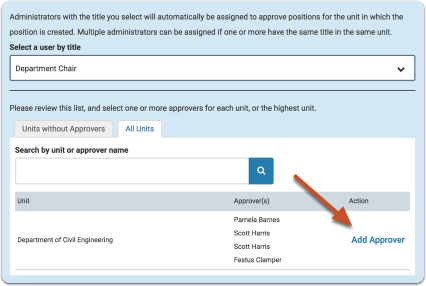 During the process of creating approval templates, the titles created here become available when selecting an administrator to fill a given title for a given unit. 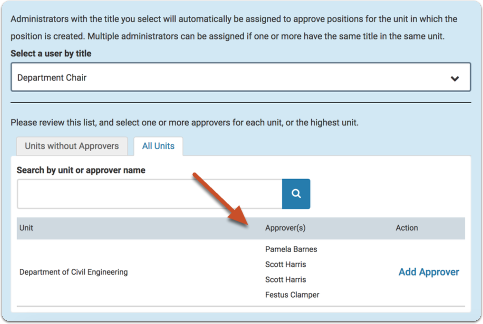 The administrator creating the approval template has the option to name an administrator as the approver of the position at that step based on unit and title. The administrator selects the title from a dropdown menu. 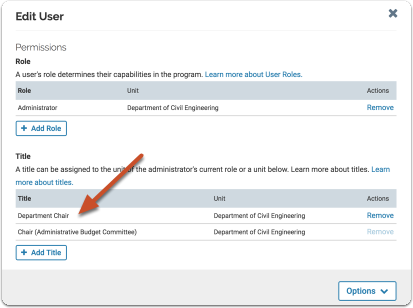 The administrator(s) who hold the title selected will automatically be appointed to approve the position at the current step for the unit in which the position was created. 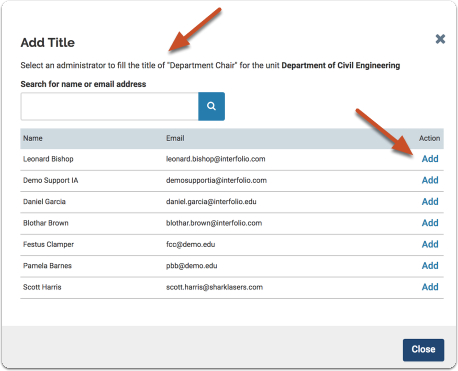 Institutional Administrators can create, edit, and delete titles if they are not linked to an active position or workflow template. 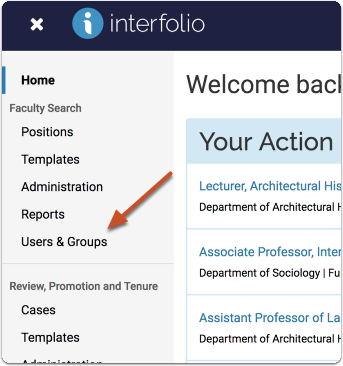 Titles are created from the Users & Groups section of Faculty Search. 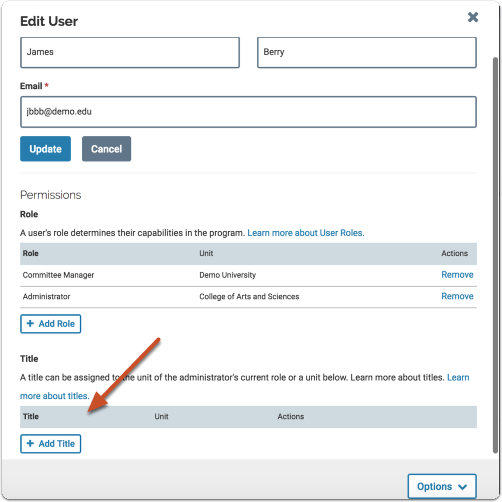 Enter the title and click "Save"
Titles are assigned to administrators when editing the user's permissions. 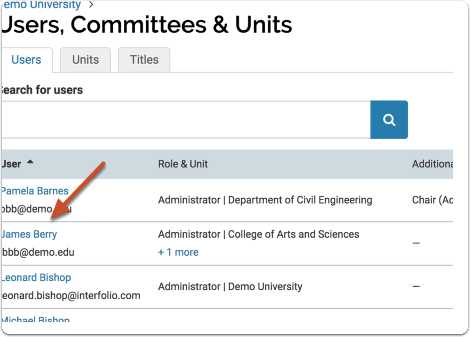 A title can be assigned to the unit of the administrator's current role or a unit below. Open the "Users" tab and select a user with the user role of "administrator"
In the "Edit User" window, scroll all the way down and click "Add Title"
Select a unit and title and click "Save"
During the process of creating approval templates, an administrator has the option to name another administrator as the approver of a particular position type at the given step based on unit and title. 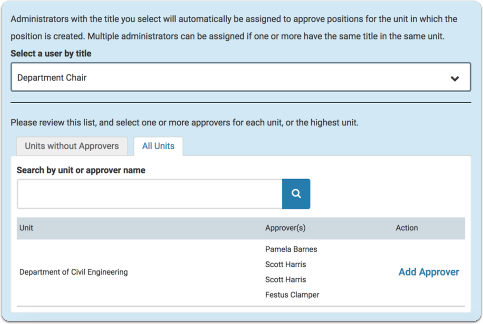 When indicating who will approve a position at a given step, select "an administrator based on unit and title"
If necessary, add additional administrators as approvers by selecting an administrator to fill the title designated to approve the position at the current step. 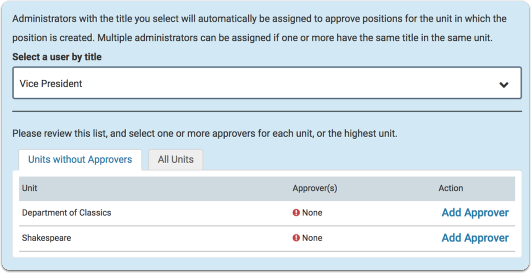 If a unit at or below the unit in which the template is being created does not have one or more approvers with the title selected, the administrator creating the template will see a list of units without approvers, and must choose one or more administrators to fill the selected title for each unit without an approver.